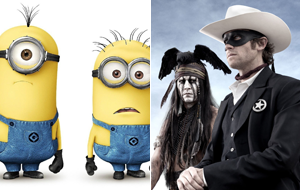 Opening in time for Independence Day weekend are Illumination Entertainment's Despicable Me 2 and Disney's The Lone Ranger. Both films release on Wednesday, July 3 with previews beginning Tuesday at 7pm. - Minions, minions, and more minions. - The original film posted a stellar box office run three summers ago, sprouting some of the best legs for an animated movie since the first Shrek. - Twitter, Flixster, and Facebook activity have been consistently strong, the former edging out Monsters University this week. - Impressive home video sales for the first film. - The all-star cast will continue interesting adult audiences. - Opening two weeks after the successful Monsters University could arguably cut down on upfront interest. - The already very busy marketplace. - Not all animated sequels live up to their predecessors at the box office (see Cars 2 and Kung Fu Panda 2). - The Disney marketing muscle. - The established brand name could cater well toward older audiences not interested in Despicable Me 2 this weekend. - The disappointment of White House Down could mean those looking for an action flick will opt for this instead. - Social network activity has left a lot to be desired. - The film is only #4 on Fandango's best sellers list (as of Tuesday afternoon). - Reviews are in the cellar. - Being adapted on a very outdated TV series likely means a lack of interest from younger audiences, despite Depp's presence. - Depp has become somewhat criticized for taking on roles similar to his Jack Sparrow character--this one being the latest subject. - Westerns typically do not fare well at the box office, especially in the summer (see Wild Wild West and Cowboys & Aliens). - Families that may otherwise check out a new Depp-Disney flick will be more preoccupied with Despicable Me 2 this weekend, among other competitors. - The film has been the target of frequent bad buzz since production began. Check out our forecast for these films and the remainder of the weekend's top 10 in the table below. Man of Steel Jun 13, 2013 Warner Bros.